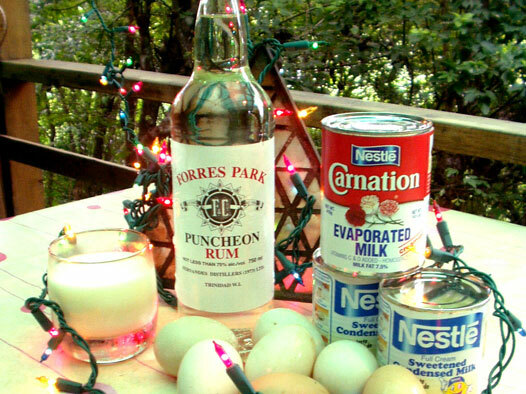 Christmas is not Christmas without a glass of Punch de Crème! Grated lime skin and the juice of a lime. Whip the eggs with the rind of a grated lime. Boil the spices together in a little water and leave to cool. When cool, strain and put into a mixing bowl. Remove the rind from the eggs and, with all the other ingredients add to the spice water. Mix thoroughly and bottle. Serve with crushed ice and sprinkle the ground nutmeg on top ..... one sip and it really is Christmas!! Christmas in Tobago is not a big affair like it is in Europe or America. But people want specific food, in this case Pork, Ham and Pigeon Peas followed by Black Cake and washed down with Punch-de-crème. .